Most heart attacks and many strokes are caused by damage to the protective lining of the arteries that feed your heart and brain. This (often self-inflicted) injury makes your blood vessels vulnerable to buildup of cholesterol deposits that can, over time, constrict and block blood flow. Cholesterol buildup in the arteries is known as plaque (or atherosclerosis if you want to sound fancy). Unlike dental plaque, cholesterol plaque is a cheesy, thick substance that doesn’t really sit on the artery’s surface but becomes incorporated into the blood vessel lining. That’s one reason it’s so hard to get rid of. Then again, cholesterol doesn’t necessarily stick to any two people’s arteries the same way. It may slide off one person’s arteries while sticking to another’s like a magnet. Scientists don’t fully understand the reason why, but the key seems to be inflammation. 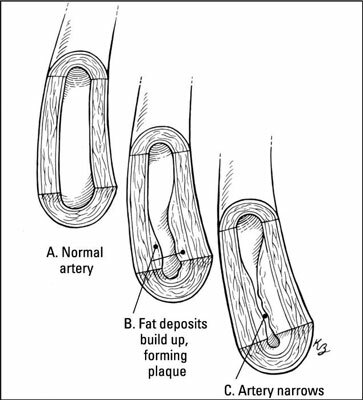 The more inflamed your arteries become, the more injured the lining, and the more vulnerable you are to plaque. High blood pressure can directly damage the walls of the blood vessels, which also makes you more vulnerable to inflammation. Genetics definitely play a role in terms of the body’s inflammatory response and plaque formation, but diet, exercise, and whether you smoke also have an impact. Diabetes and obesity are other important sources of inflammation. When it comes to cholesterol, the ideal numbers vary depending on your risk factors for cardiovascular disease. Doctors used to measure total cholesterol and leave it at that. As long as the number was under 200, everyone was happy. Now that LDL (the bad cholesterol) and HDL (the good stuff) are measured routinely, the total cholesterol number isn’t very meaningful. Some people have a high total cholesterol simply because their HDL level is high; others may have a dismally low HDL count with a high LDL count and yet a seemingly normal total cholesterol level. Newer guidelines have made the idea of shooting for specific targets somewhat controversial, but it helps to have a framework to understand what goals are optimal for you. For men and women, LDL should run around 100 or less. If you have cardiovascular disease or diabetes or are otherwise high risk, less than 70 is considered optimal. At these levels, you’re less likely to have cholesterol buildup in your arteries. Yet the average American’s LDL cholesterol is around 130. Contrast this with the LDL of 50 to 70 typical of native peoples who have to hunt and gather their food, and it’s clear that the Western diet and sedentary lifestyle have really done a number on the typical American’s cholesterol. The good news? You have room for improvement. For women, an HDL of 50 or better is considered ideal; for men, the target is at least 40. In general, a high HDL is protective. Women naturally tend to run higher HDLs, in part because of the female hormone estrogen. Some people are genetically inclined to low or high HDL, but lifestyle and diet have a huge influence. For men and women, triglycerides should be at 150 or less. Like cholesterol, triglycerides are often a marker for a healthy or not-so-healthy lifestyle. Some people inherently have very high triglycerides, but in most cases, a healthy diet, weight loss (when needed), and regular exercise bring these bad boys back in line. When they get extremely high (usually over 1,000), triglycerides can cause pancreatitis, an inflammation of the pancreas, an organ that sits next to the liver. No matter what health issues you may or may not have, the cornerstones of cholesterol management are diet and exercise. Treatment with cholesterol medications is an important part of preventive medical care for people who’ve already been diagnosed with heart disease or stroke or for those who are at high risk, including people with diabetes, but it’s not for everyone.